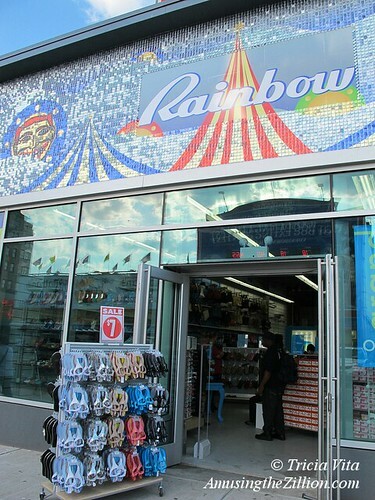 Last June, Rainbow Shops, a retail chain featuring discount clothing and shoes, opened on the Stillwell Avenue side of Thor Equities’ “Retail Ride of a Lifetime” Building across the street from Nathan’s Famous. 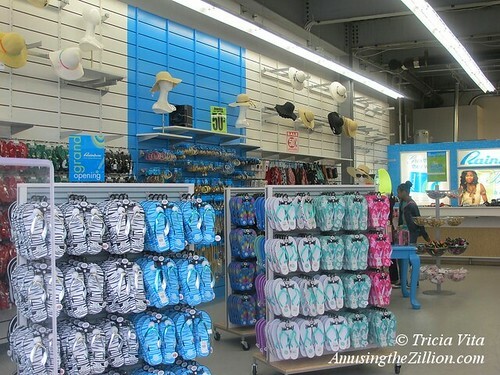 At the end of October, Rainbow closed and was emptied out, but now they’re baa-ack with sun hats and flip flops galore. 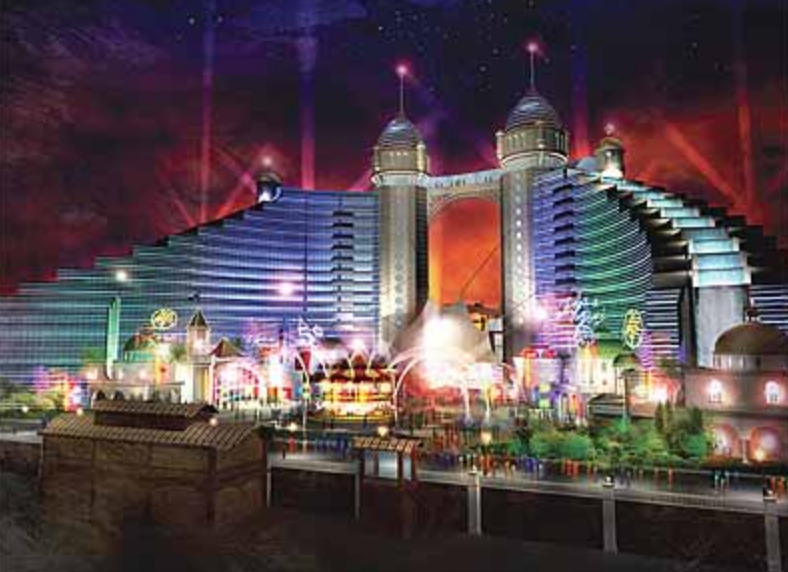 The Bloomberg administration’s 2009 rezoning of Coney Island’s amusement area allows accessory retail on the block where Shoot Out the Star and other games once amused in the demolished Henderson Building and where they would no longer be able to afford the rent. 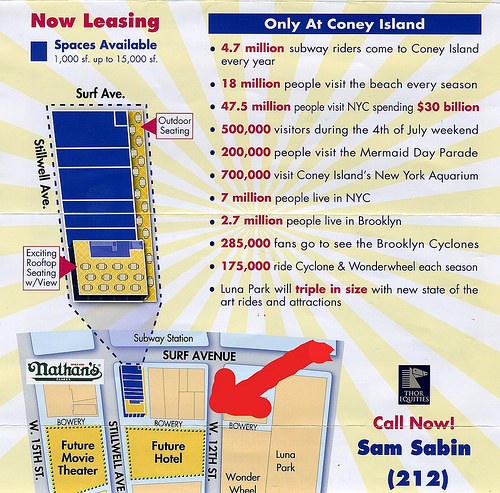 Founded in 1935 and headquartered in Brooklyn, Rainbow Shops and sister brands have over 1,000 locations and join a slew of chains and franchises leasing space in the new Coney Island, including It’Sugar, Applebee’s, Johnny Rockets, Burger-Fi and Subway Cafe. Meanwhile, the dummy “ARCADE” next door to Rainbow Shop remains as vacant as ever. 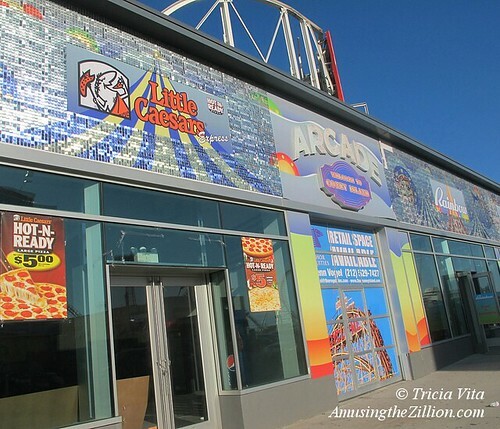 Thor’s retail building continues to flaunt two ARCADE signs but no arcades, despite the fact that 15% of amusement frontage was required by zoning regulations to obtain the Certificate of Occupancy from the City. ATZ wrote about this sham in June 2013 and again in October 2013. We tweeted about it last week. 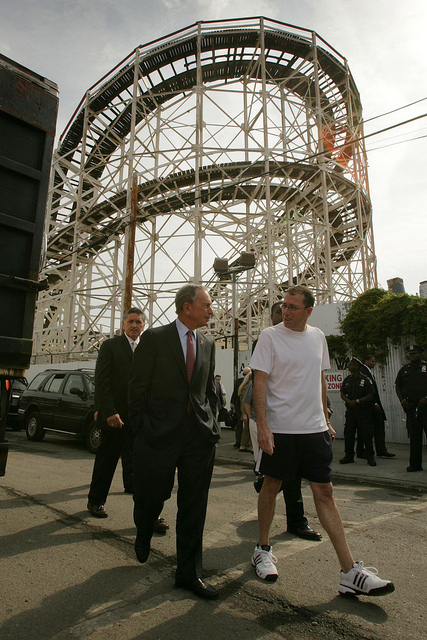 March 17, 2014: Will Rides Return to Thor Equities Vacant Lots in Coney Island? 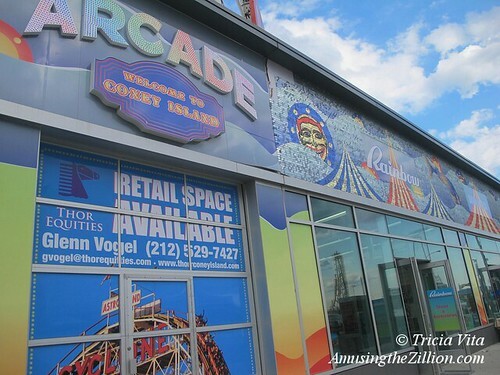 The latest chain store to invade Coney Island’s amusement district has opened and it is neither “hip” nor “glitzy,” words used by the mainstream media in recent weeks to describe the chainification of Coney’s Surf Avenue. 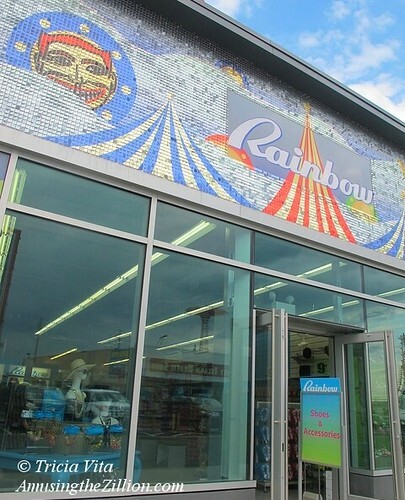 Over the weekend, Rainbow Shops, which sells discount clothing and shoes, opened on the Stillwell Avenue side of Thor Equities’ “Retail Ride of a Lifetime” Building, across the street from Nathan’s Famous. Shoot Out the Star, Basketball, Balloon Dart and Water Racing as well as the Fascination Arcade were among the amusements in the Henderson Building, which was on this corner until Thor CEO Joe Sitt demolished it in 2010. 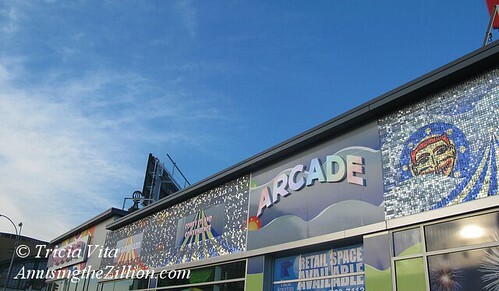 This is the new retail building flaunting two ARCADE signs but no arcades, despite the fact that 15% of amusement frontage was required by zoning regulations to obtain the Certificate of Occupancy from the City. We wrote about this sham last week. The “ARCADES” remain vacant. Apparently, having an ARCADE in name only is fine with the City. 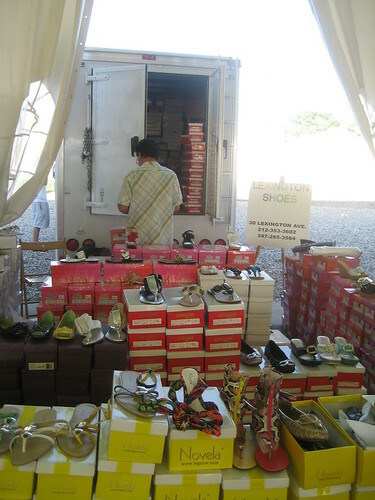 Anything goes as long as Thor’s Coney Island has shoes galore! 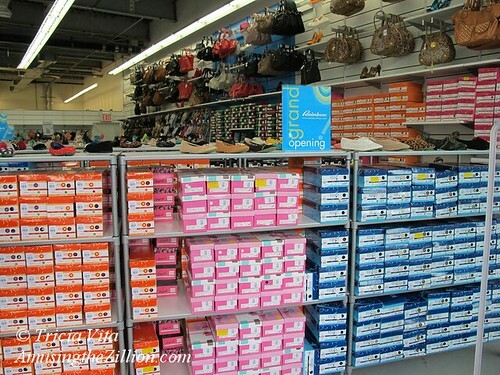 The 2,500 square foot Rainbow Shop, the maximum size allowed by the Coney Island Rezoning of 2009, is filled with aisle after aisle of shoes in shoeboxes, just like a warehouse outlet. It’s as if the store owners expected the “PEDESTRIANS GALORE” (“4.7 million subway riders visit Coney Island every year, 13 million people visit the beach every season and over 100,000 people visit Coney Island’s Luna Park on the 4th of July!”) touted in Thor Equities property description to arrive shoeless. In 2008, Thor Equities dismal flea market on the Coney lot where the Tornado Roller Coaster once thrilled had vendors selling clothing and shoes, both new and used. At the time, it was a reminder that Joe Sitt’s pitch book unsuccessfully used to lobby Borough President Marty Markowitz for 10,000 square foot retail touted flagship retailers such as Abercrombie & Fitch, Gap/Banana Republic, and DSW (“Thousands of shoes…prices you love”). Now it appears to have been a dress rehearsal for Rainbow Shops. The Brooklyn-headquartered retailer has 28 stores in Brooklyn and over 1,000 locations nationwide.